Yamaha has been building pianos in Japan for more than 100 years, and is a mainstay in universities, studios, and homes throughout the world since the 1960′s. The Yamaha U1 is considered by many to be baseline by which other pianos are measured. 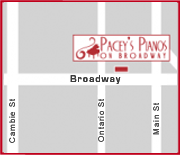 Pacey’s Pianos is Vancouver’s largest dealer of used Yamaha pianos. We rent and sell more used Yamahas than any other store, which means we have the best choice, the best stock and the best prices available. Read more about our high-quality used Japanese pianos. With dozens of pianos to choose from covering most models and styles, you will not only get a great price on a fantastic instrument, but all of the pianos are rentable with our famous Rent to Own program. Legendary Yamaha quality and craftsmanship in this instrument, at 48″ tall it is the first professional series piano and the most popular new piano in Yamaha line. It sets the minimum requirements for long term study and use. Half way between a U1 and a U3 at 50″ tall, it is every bit a Yamaha and great for work or study. Th U3 builds on Yamaha’s U1, the industry standard for practice and small venue performance. 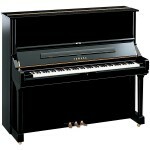 It is the ideal piano for study and practice and has been the institutional choice for many years. Like the professional series uprights, the Yamaha grand pianos are hand crafted and built for performance and pleasure. After they have been played, it is clear why so many top professionals and venues choose Yamaha grands for performances. The serious piano player understands the value of a Yamaha grand piano. 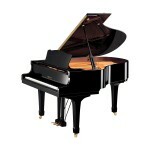 The C, or Conservatory Series, grand piano is a favourite of the likes of Diana Krall and Elton John. These are available in the C1 5’1″, C2 5’8″, C3 6’1″, C5 6’7″, C6 7′, C7 7’6″ and CF 9′ in length. 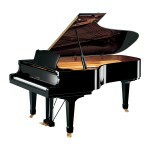 Yamaha G or GC or GM grand pianos are the entry level Yamaha grand. They are built for and well suited to a smaller studio or home environment. They will meet the basic needs of most players until the intermediate level. The Yamaha G Grand is great value for the money! They are available in the G1 5’1″, G2 5’8″, G3 6’1″, and G5 6’7″. I was getting married and my wedding gift from my husband was a grand piano. My husband arranged for the piano to be delivered to our house while we were gone on our honeymoon. When we returned we found the black baby grand sitting in our livingroom....wrapped completely with the largest red bow I have ever seen in my life. It had been tuned and polished while we were gone. The tuning and polishing were not ordered but were provided free of charge as a wedding gift. Thank you, Sean.